Leaving the eternally synonymous Tour de France town of Pau, the course of Stage 12 is a testing affair which does not conclude until after 214.5km of racing en route to the finale atop Peyradgudes. A long day in the saddle, the onslaught of climbs which feature today have the potential to force cracks to appear amongst those with eyes upon the general classification at this year’s race. After a couple of moderate ascents, the Category 1 Col de Menté appears on the radar to initiate the real battle for the day, lasting a total of 6.9km and averaging a gradient of 8.1% to really test the legs of the frontrunners. 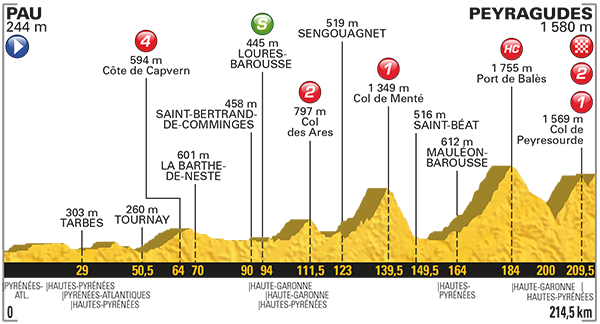 The bunch will then plunge into the valley, before then turning onto the opening the slopes of the Category HC Port de Balès (11.7km, avg 7.7%). The climb is often seen to switch between gradients, making it tough to find a rhythm for for the riders, though much of the focus will be upon the following technical descent. The finale is signalled by the Category 1 Col de Peyresourde, an awkward climb which lasts 9.7km and averages a gradient of 7.8%, though much of the day’s anxiety will be upon the final few kilometres. The Category 2 rise to Peyragudes touches a gradient of double figures and could see some riders lose time if they crack late in the day. Chris Froome has often chosen to hammer home his advantage during grand tours at the earliest opportunity possible, making it likely that he shall be one of the key protagonists once again. His form is improving without doubt, and previous performance upon this concluding climb hint at Froome’s ability to bury the opposition with ease. If the day’s result does end up being decided by a group of elite riders, then it seems most likely that the defending yellow jersey winner will be the strongest man remaining. Romain Bardet is likely to utilise the day’s descents in order to apply pressure to his major rivals, though will also be aware that the final rise to the finish is within his capabilities also. The Frenchman took a tumble yesterday, though appears to be in a good condition regardless, hoping to making one of the few summit finishes of this year’s Tour de France count for something with so much still at stake. Dan Martin was extremely unlucky to be brought down as a result of Richie Porte’s crash a couple of days ago and will be strongly motivated to make his current form count for something, hopefully with a strong performance today. The Irishman has the acceleration required to beat the majority of big name climbers in the final metres and will be a rider who nobody wishes to carry all the way to the summit finish. Fabio Aru knows how strong his form is right now, but needs the ideal situation in order to make a serious impact upon this year’s Tour de France. If others within the main group decide to hesitate during the final kilometres, then the reigning Italian road race champion will have a brilliant opportunity to secure a richly deserved stage win at last. His aggressive nature and love for steep gradients lends itself well to the rigours of today, perhaps emerging as the main threat to Chris Froome in the final kilometres. Others to consider include Serge Pauwels, Warren Barguil, Pierre Rolland, Tiesj Benoot and Rigoberto Uran. Posted on July 13, 2017 July 13, 2017 by Spokenforks	This entry was posted in Le Tour de France 2017, News and tagged Chris Froome, Dan Martin, Fabio Aru, Le Tour, Le Tour de France, Le Tour de France 2017, Le Tour de France 2017 Stage 12 Preview, Pau, Peyragudes, Pierre Rolland, Rigoberto Uran, Romain Bardet, Serge Pauwels, Thibaut Pinot, Tiesj Benoot, Warren Barguil. Bookmark the permalink.